Nothing invokes cottage more than beadboard. And if you don’t want to get your saw out to cut REAL beadboard…go for the wallpaper. I am in love with bead board wallpaper! It’s so easy to install. It’s pre-pasted and ready to go. 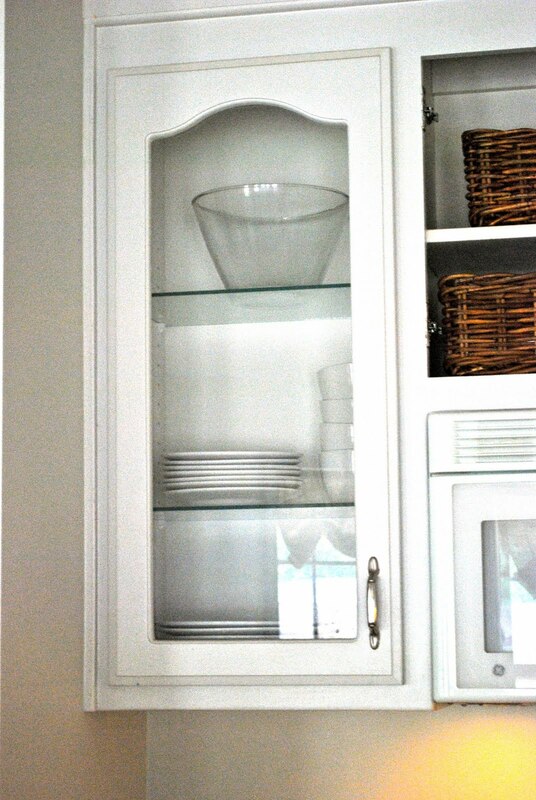 It can make a cabinet go from ho-hum to Fabulous cottage…in minutes. All you need are a few tools…if you can call them tools. I use my cutting mat and my rotary cutter for everything…even to cut fake wood floors. 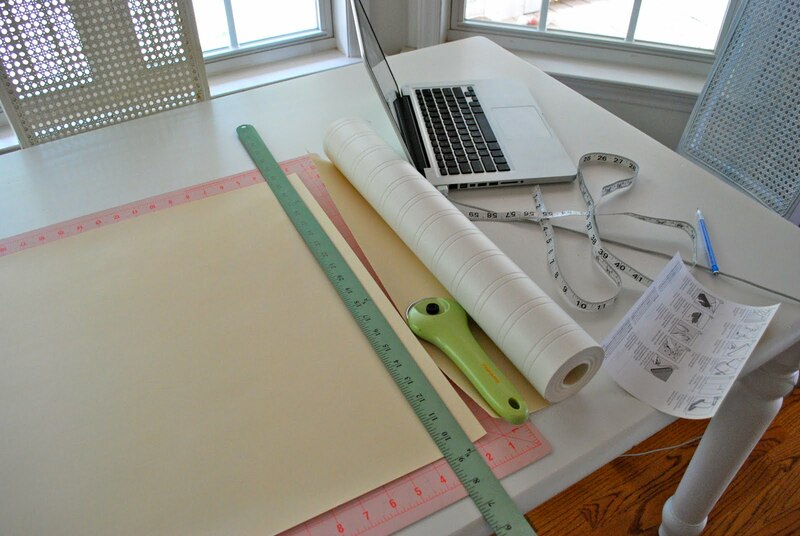 Yes, you’ll have to buy a new rotary blade, if you ever want to cut fabric again…but it’s so easy to use. I measured the inside of my cabinet with a measuring tape. Then measured my wall paper and cut it to size using my yardstick for a straight line. Dip it into the water for a few seconds and paste it up. Tah-dah! Easy Peasy! I still haven’t painted it and was going to use a high gloss white because white is my comfort and my safe color and I don’t know how to branch out. I was thinking of doing a color, a muted color of course…like a light gray. What do yall think? I love it and I think it looks pretty white. I didn't know you could paint it? So it has grooves in it just like real beadboard? Can you tell me where you purchased your wallpaper? Ok one more question, sorry, I have old tile in my bathroom and I have always wanted beadboard in there, do you think it would stick to tile? Looks fantastic….I might like it painted…but it's cool in white, also. Go for the color…muted blue or grey. That little bit of detail really makes a difference! It looks great! I'm so glad you came by and left a comment, because now I found your blog! Love the use of the beadboard wallpaper for this purpose! And to Rose Vine Cottage, I wallpapered over undesirable accent tiles in my kid's bathroom, which worked well for a long time (I know – hard to imagine that this looked good, but it did), but eventually it started peeling off. I love the beadboard wallpaper! I think it looks great white, but I think painting it gray would give it that extra special detail! 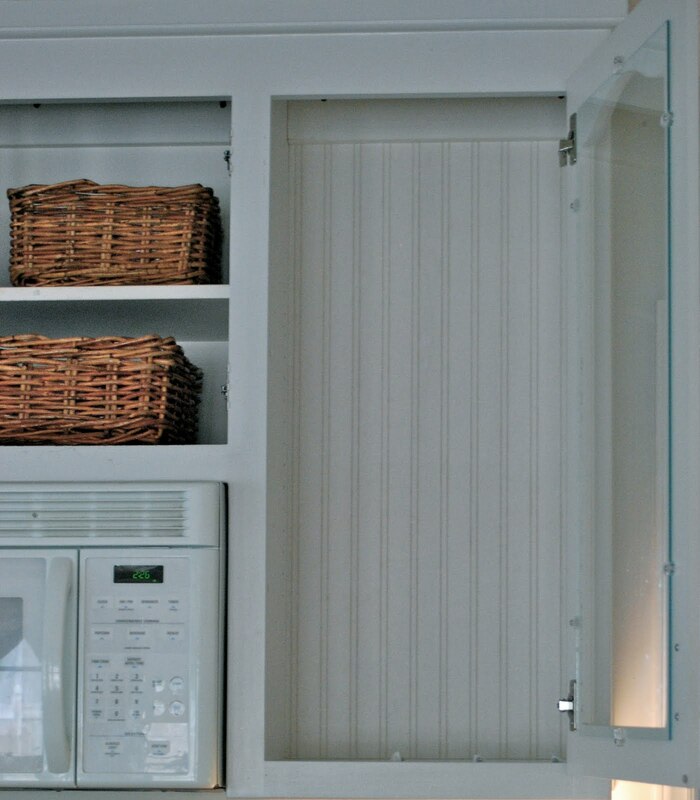 Love, love love beadboard. We're building a summer cottage on the sea in New Zealand and I want beadboard everywhere. Keep it white …the cabinet that is as I'm assuming you can't paint the wallpaper. It looks great just as it is! oh! I almost forgot! Remember “Drug behind a truck?” I finally finished the slip cover! I think you will be very proud of me 😀 Although, the weather here is yucky. I am going to wait and take some pictures when there is better lighting. I can't wait to show you. What an absolutely wonderful idea. Have never seen beadboard wallpaper. Who carries that? You are amazing. adore it completely. gray or white, it's perfect! What a great idea to use inside cupboards. We are lucky as our old home has orignal bead boarding but I do like the cupboard idea. What a fabulous idea! That's why I'm addicted to this blog because your ideas are fabulous and achievable! gray would be beautiful or a robins egg blue. That is a great idea to do the inside of a cupboard. Wow, this is so cool. I've never heard of bead board wallpaper! Thanks for the inspiration! Beautiful blog too.